The minute I saw it, I wanted it to follow me home and come live in my garden, forever. And so I gave the guy who made it a little something called cash, and the bird followed me home. Or rather, I picked it up and carried it to my vehicle, figured out how to put it in the back without gouging the upholstery, and drove it home. It's quite a bird, with its rakish tail feathers, big washer eyes, and spoon handle head feathers. Gotta love it. It even has a place to hold a pot of flowers, should I choose to add a pot of flowers. And I probably will choose to add a pot of flowers. I smile every time I see it, and I see it as soon as I go out the backdoor to the garden. This means that now whenever I go out the backdoor into my garden, no matter what my facial expression was when I got to the door, I'll immediately smile, and enter my garden with a smile. Because if you aren't smiling in your own garden, somethings not right and you should fix it until it is right. Oh sure, there is a lot that isn't exactly right in my garden. I could make a list. Weeds. Check I have those. Unplanted areas or areas I wish would fill in faster with spreading plants. Check and check. Weeds. Oh, yes, I mentioned them already, but by weeds this second time I mean that dastardly thistle. Shudder. It can wipe smile off my face faster than a toothache. But I won't let it. 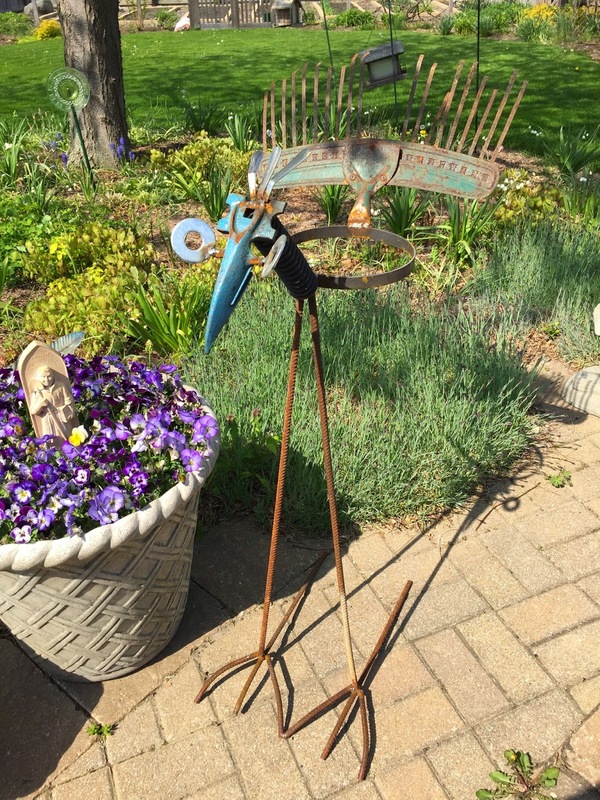 Because I have a funny bird sculpture in my garden now. The eternal smile maker. It needs a name. I'm thinking Esmerelda, since the first letters are E-S-M, which stands for "eternal smile maker". Yes, Esmerelda it shall be. She'll watch over my garden when I'm not around and make sure I always wear a smile when I am around. Who knows, she might even write a guest post on this very blog someday. I love it! A few years ago, I noticed a cute peacock sculpture in a neighbors yard. Every time I walked by, I giggled. I found one a couple of years ago, and bought it. It just makes me giggle. I haven't named him. Perhaps, I will! I am certain that when Esmeralda becomes acclimated to the garden, fairies and various goings on that she will have an opinion and will express it beautifully. She is quite the looker. I don't know much about art, even garden art, but it seems to me that the major criterion for calling something art is that it should make you smile. Esmerelda is a beauty! I'd love to hear her opinions one of these days. Oh I too own an Esmerelda and even when I don't see her, I smile whenever I go into my garden.. it us certainly my own, private world. .. I love it, Esmerelda would bring a smile to the dourest of faces.